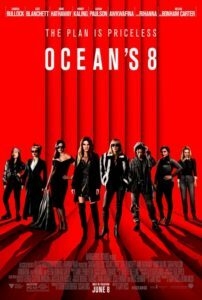 Ocean’s Eight is the newest addition to the Ocean’s “heist film” series rebooted by Ocean’s Eleven in 2001. 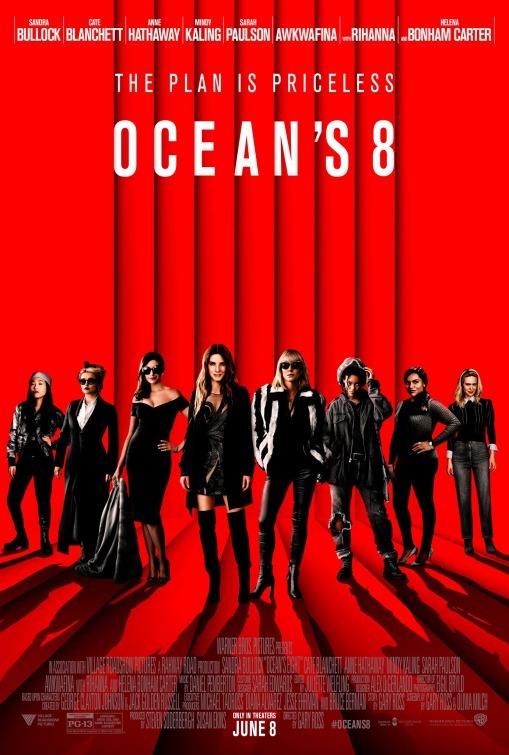 Ocean’s Eight focuses on an all-female heist crew, so it represents a somewhat revisioning of the franchise. The film also includes a bevvy of good actors. Unfortunately fine acting can’t lift Ocean’s Eight over what is a very predictable plot. This is unfortunate. The movie as a whole is tightly written, the dialogue well written, and the characters well drawn. Few holes are left unfilled, so the story ties together well. The cinematography is visually excellent, and the setting–The Met museum in New York City–is elegant and appropriate for a big heist. The problem with the movie is its lack of suspense. Audiences will enjoy the ride, but they won’t be on the edge of their seat. This entry was posted in Film Reviews, Films and tagged Anne Hathaway, Cate Blanchett, movie review, Ocean's Eight, Sandra Bullock on June 9, 2018 by SR Staley.